Significant advances have been made in human health and ecological risk assessment over the last decade. Substantial challenges, however, remain in providing credible scientific information in a timely and efficient manner to support chemical risk assessment and management decisions. A major challenge confronting risk managers is the need for critical information to address risk uncertainties in large chemical inventories such as high- and medium-production-volume industrial chemicals or pesticide inert ingredients. From a strategic and tactical viewpoint, an integrated approach that relies on all existing knowledge and uses a range of methods, including those from emerging and novel technologies, is needed to advance progressive and focused testing strategies, as well as to advance the utility and predictability of the risk assessment by providing more relevant information. A hypothesisbased approach that draws on all relevant information is consistent with the vision articulated in the 2007 report by the National Research Council, Toxicity Testing in the 21st Century: A Vision and a Strategy. 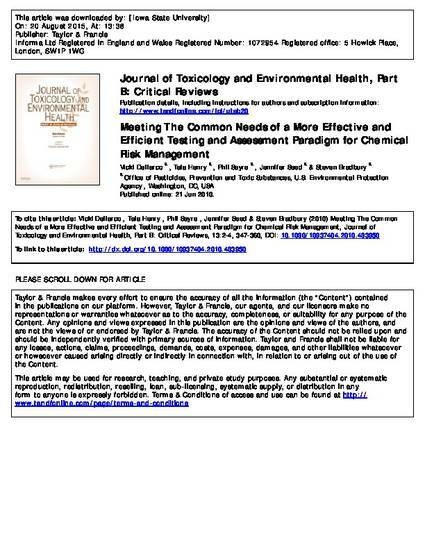 This article describes the current practices in evaluating chemical risks and ongoing efforts to enhance the quality and efficiency of risk assessment and risk management decisions within the Office of Prevention, Pesticides, and Toxic Substances at the U.S. Environmental Protection Agency.